Classic fresco style gets a modern twist in this expansive valley view. 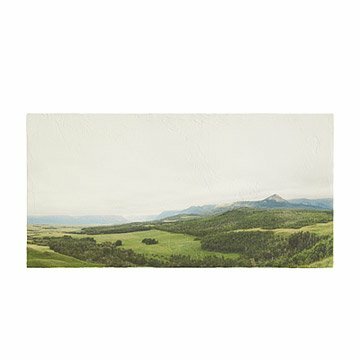 Bring a touch of the Canadian wilderness inside with this gorgeous fresco print of rolling green hills and distant snowy mountaintops. Makers Vicki Rulli and Tom Heaphey re-imagine the classic renaissance style by using the texture to enhance modern printed photographs. To achieve this painterly effect, sustainably harvested birch is plastered in a fresco technique, then the photograph is printed on the surface with UV-cured pigments to bring lasting life to each majestic tree and rocky peak. Handmade in Springfield, Ohio. Both Vicki and Tom started out planning a career in the arts. Vicki - always with a camera, and Tom painting, sketching and photographing. However, they both ended up in a different place... Tom in Finance, Vicki in Russian language and literature. In between running a creative business, and hanging out with their kid and cats, Vicki and Tom are both private pilots and used to own a 1949 Cessna 170A. They love to eat, travel, hang out on their patio, visit art museums, ride their bikes, be a part of their community, drink coffee, read books, and laugh with friends. They have traveled all over the world - always being inspired by all they see and everyone they meet. Dust with feather brush or wipe with damp cloth.